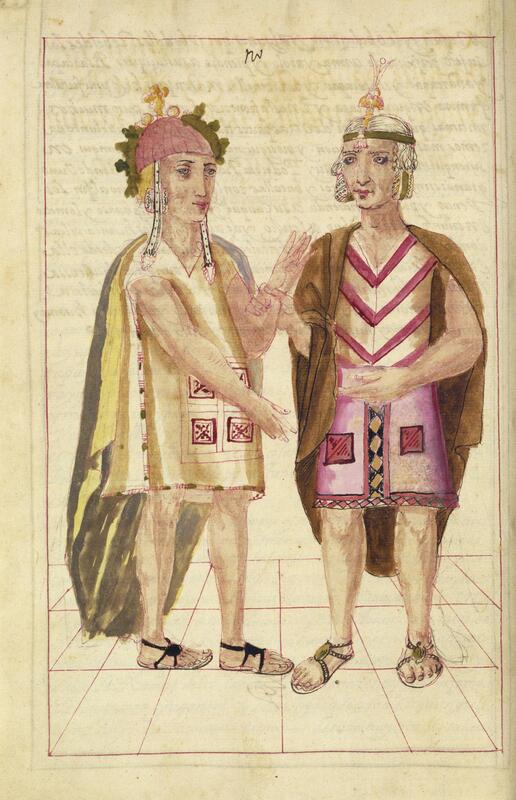 This manuscript page, which shows two Inka men of the highest status, uses European painting conventions to recreate a scene from the pre-Hispanic past. This manuscript, entitled The General History of Peru, was created in the early 17th century in Peru, a project of the Mercedarian friar, Martín de Murúa. The historical moment shown here is the passing of the Inka throne from one ruler to his son. At right is Pachacutic Inka Yupanqui, a Sapa Inka of the 15th century. He wears a royal tunic and sandals, and his fringed crown was called the mascapaycha, the headdress of the Sapa Inka in pre-Hispanic times. Before the arrival of the Spaniards, only the ruling Sapa Inka could wear the red-fringed crown. At left is the ruler’s son, Tupac Inka Yupanqui, who would take the throne from his ailing father. He, too, wears a royal tunic and sandals, but not the mascapaycha. While the two men appear dressed as pre-Hispanic Inka, portraiture itself was a European introduction—under the Inka, there existed no tradition of depicting the bodies of rulers in painting. The floor of rectangular tiles is more likely a European convention for representing figures in space than an actual feature of the Sapa Inka’s palace. The images in the General History of Peru, or Historia general del Piru,were probably created by a workshop of painters, one of whom was Felipe Guaman Poma de Ayala, an Andean man famous for his own 17th-century account and images of Peru, the New Chronicle and Good Government. Martín de Murúa, who wrote the text of this manuscript and commissioned its images, was a Mercedarian friar who worked in the Viceroyalty of Perú. This is one of several manuscripts concerning the Andean past he created in the 17th century. The painting is one of 38 images in the larger manuscript, General History of Peru. It was created on European paper with watercolor paints, and measures 12 x 8 in (ca. 30.5 x 20 cm). Martín de Murúa’s history of Peru survives in two versions—a draft and a final copy. This painting comes from the final version. Originally produced in Peru, the manuscript was once owned by the English Duke of Wellington and today resides in Los Angeles, California. This scene of long-dead historical figures could not have been painted from life, and its artists may have drawn from oral accounts, particularly those of the khipukamayoc, skilled interpreters of the khipu. 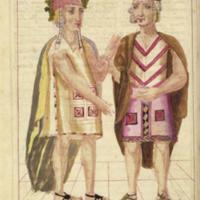 But these artists may also have looked at real clothing in depicting the rulers’ costumes. For actual 16th-century tunics similar to those pictured in the General History were known in the 17th century and have survived to the present. This page suggests some of the many ways that the Inka past was “remembered” and shaped in the 17th century: through indigenous accounts and records (like the khipu), through indigenous-Spanish collaborations and through the preservation of actual objects from pre-Hispanic times. Cummins, Thomas and Barbara Anderson, eds. 2008. The Getty Murúa: Essays on the Making of Murúa's Historia general del Piru. Los Angeles: Getty Research Institute. Murúa, Martín de. 1987. Historia general del Perú. Manuel Ballesteros, ed. Madrid: Hermanos García Noblejas. New Haven and London: Yale University Press. Los retratos de los incas en la crónica de Fray Martín de Murúa. 1985. Lima: Industrialgráfica.